Through the course of many prior years, numerous guitarists have solicited my advice on how to find a great sounding jazz guitar with excellent playability and at an affordable price. I’ve observed many aspiring jazz guitarists who have unknowingly limited their potential by playing an inferior instrument, almost always due to the constraint of high prices. On the other hand, I have also seen dramatic improvements in skill levels even when entry level guitarists begin using a quality instrument that is set-up to play easily. In 2006, I compiled a group of the most desirable specifications and features as those are critical to achieve outstanding tone, playability and beauty. After much searching at several trade shows, I was simply unable to locate a high quality instrument with all the most desirable features and at a reasonable price level. At that point in time, I decided to redirect my search toward locating a quality manufacturer who could produce such a guitar for me with an emphasis on high quality workmanship, desirable features – and a price point that most folks could afford. While attending the 2007 NAMM Expo, I had the extremely good fortune to locate an OEM (Original Equipment Manufacturer) who could actually build this “Dream Guitar” for me. I received the prototype in early Spring of 2007. The first unexpected surprise was the “take it to the bandstand” playability right out of the box with nothing more than minor adjustment of the bridge and tuning the strings. At that point, there was no doubt that I had received a very special instrument. However, as I am still a working musician, the real test of quality and durability was still to come. For the remainder of 2007, 2008 and into 2009, I played the prototype every day for many hours, either on a bandstand, or in front of a video camera. As you may be aware, I used this guitar on six DVDs in the Source Code series, along with the first two volumes of Ticket To Improv. In addition, there are numerous videos that can be found throughout the internet. Through all of the above mentioned usage, this instrument has continuously performed to my highest expectations. Without doubt, I can’t imagine any other test of quality and durability other than playing an instrument on a daily basis for over two years. As a personal testimonial to the quality of this instrument, my name is on the head stock. I chose “Equity” as the model name, as I firmly believe your instrument will deliver excellent service and value for many years into the future. After the first contracted production run ended, I took a year to develop the new generation of the Conti Guitar. Having received much feedback and suggestions from our patrons, I made some modifications and additions that I think you will enjoy. I received numerous inquiries for a lower priced laminate version of the Conti Guitar. Having always owned and played solid wood instruments, I was skeptical about producing a laminate model. However, after receiving the first prototype, I was astounded by the quality of the sound. I’m proud to introduce the Entrada, an affordable high quality laminate model which features the exact same neck and fingerboard that made the original Conti archtop a worldwide success in 2009. The biggest change was reducing the size of the body from 17″ down to 16″ to make the instrument body more comfortable for those who struggle with a full size 17″ body. If you’re ready to make the transition from that old solid body rock axe to a jazz guitar, you won’t go wrong with the new Entrada. 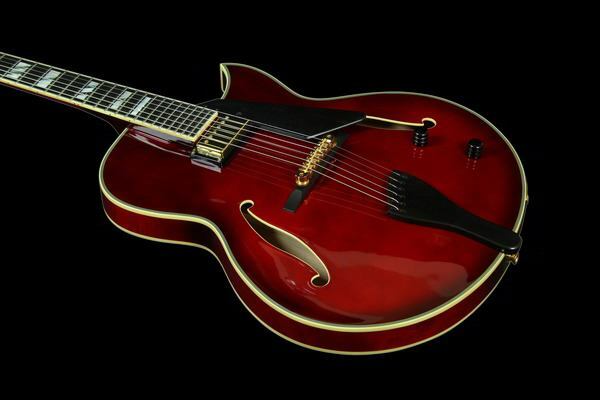 Continuing the tradition of the top of the line solid wood model, I’m proud to introduce you to the Heirloom – a thinline archtop also featuring the 16″ body, along with Grover® Imperial Tuners, an Ebony Pickguard and Tailpiece, and a TonePros® TOM bridge mounted to an Ebony Floating Base. This all solid woods construction instrument is priced less than many laminate construction instruments on the market, yet it includes all high quality features and components. 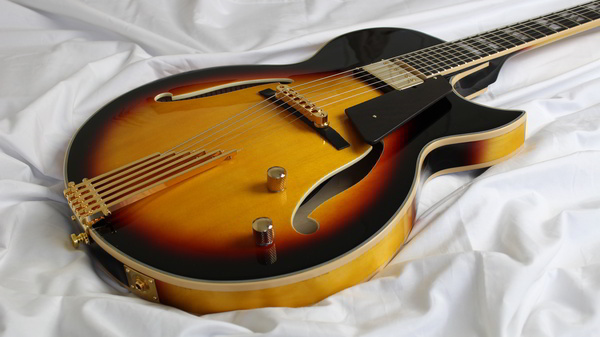 As is the case with most working guitarists, you’ve more than likely experienced many occasions when you were dreading taking your expensive high end archtop jazz guitar into harsh and inclement weather conditions. You can now solve that problem quite easily as any one of the Conti Guitar models at our affordable prices, will serve you well on any gig that requires a classy instrument that sounds as great as it looks.